These days, there is a sound reverberating all across the India. It’s the sound that beckons the ‘Men in Blue’ to achieve a feat that they have been deprived of for the last six World Cups, asking them to repeat what they did in white jerseys on British soil almost three decades ago. The game is the same and so is the goal, but a lot of things have changed and evolved over the years. Here we compare the modern day ‘Men in Blue’ to the ‘Men with Moustaches’ of the classic cricketing era. Under normal circumstances a comparison between the players of two altogether different eras wouldn't be warranted, but these days are exceptional circumstances in India. The optimism in the air across India and the reminiscence of victorious days of 1983 force us to relate the present day opportunity to the glorious past. The 1983 squad was quite inexperienced with the exception of 2-3 players whereas the 2011 squad has a good balance of young players as well those who are experienced. The 1983 team had 6 all-rounders, 4 batsmen, 3 bowlers and 1 wicketkeeper batsman, whereas the 2011 WC squad is comprised of 2 all-rounders 5 batsmen, 8 bowlers and 1 wicketkeeper batsman. As soon as the squad for World Cup 2011 was announced by the Board of Selectors, BCCI, most cricket pundits immediately began comparing the 1983 victorious squad, drawing different analogies between now and then, and analyzing every angle is such a way as to make it possible or even probable for the current Indian squad to be the favorites to win this year’s Cricket World Cup tournament. Before drawing any analogy, let’s consider how the game has evolved over the last three decades. 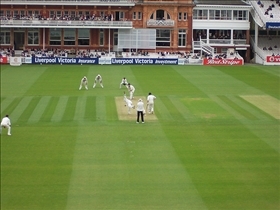 The 60 overs game is reduced to a 50 overs format. Boundaries have been brought in by about 10 yards. The game has been commercialized to a heretofore unimaginable extent! Most People see Sehwag taking on the role of Kris Srikkanth who played swashbuckling innings in the 1983 final. Sachin Tendulkar is generally put in the place of Sunil Gavaskar, however one must recall that the latter was more of a Test player and only has one century to his name in the ODIs. The 1983 side had the biggest asset in the form of its inspirational captain Kapil Dev whereas the current Indian side sees the most experienced batsman Sachin Tendulkar as the key to their aspirations and the one who will lead the charge to the new title. Kapil Dev was the captain of Indian team at the 1983 World Cup. He was an exceptional all rounder, a swing maestro, an explosive batsman, and an immaculate, emotional and inspirational leader who believed in commitment more than anything else. On the other hand, the current Indian skipper MS Dhoni is a wicket keeper batsman better known for his sensible batting and also for the occasional unconventional hotheaded hits if the situation demands. When it comes to leading the Indian side, his cool temperament, strongly positive attitude and professional captaincy are the pluses he brings to the team. In 1983 world cup, the Indians were total underdogs, but in the present scenario they are the favorites. In 1983, the team strategy was to restrict the opposition to a moderately low score and put up a moderate total. They lacked the ability to put up or chase high scores. The current team on the contrary is capable of both putting up mountain total and also chasing it down. The 1983 Indian team relied heavily on the all-rounders, especially on the swing bowlers. Today’s Indian team relies heavily upon their batsmen and spinners. As the World Cup is being hosted by the Indian subcontinent, the team is expected to be helped by the dry and high scoring pitches and immensely supportive fan base. 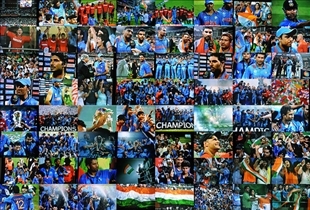 : India won the well deserved cricket world cup title for the second time on April 2nd, 2011. Which World Cup Indian Cricket team is better? why dhoni are taking 2 spinner and two seemer.when we are seeing that most succesful team like westindies and australia are takin three seemers with one spinner.we have also part time spinner like yuvraj singh which are continusly doing good performance with ball. Wonderful...The India Cricket Completes a Full Cycle of 28 Years, what a magnificent Performance, this win will stay in our memories in the years to come.